When you look at the history of art you will see very different trends in different parts of the world. 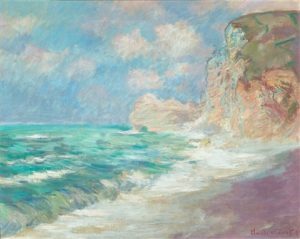 While much of the mainstream art has been produced in Europe, thanks to major artists such as Claude Monet and Leonardo da Vinci, their influence can be seen in the works of other artists around the world. In the US, for example, many of the wealthier citizens chose to import art from Europe in the 19th century. This brought it to the attention of American artists who then became familiar with the different art movements. Italian artists have had arguably the strongest influence on artists of other countries. The Renaissance brought with it a strong desire to portray everything as realistically as possible and artists such as Leonardo da Vinci spent hours studying and examining their subjects so that they could be sure that they would capture every detail. Later on the Impressionists would move away from this, aiming to capture light and ‘impressions’ on the canvas. The post-impressionists went for bold colours and bright images. France was an important location for both of these artistic movements. Each art movement has been influence by other artists and goes on to influence new artists, allowing them to develop their own style and create new art movements. A good example is the impressionist movement, which evolved neatly to become post-impressionism, but the impressionists learned a great deal from classic artists who preferred traditional methods. Art encompasses many mediums including painting, sculpture and ceramics and each of these has a unique style in each country and art movement.